I went for a hike the other day. It was a real hike. I went on a trail and everything. I hiked a few miles out then I hiked a few miles back. When I got back to civilization I noticed that there were dozens of little rocks stuck in the treads of my shoes. I don’t like rocks in the bottom of my shoes. I sat down, pulled off my shoe, and used a little stick to poke out all the rocks. Then I did the same to the other shoe. I felt better once all the rocks were out. 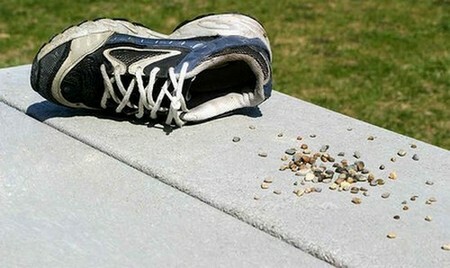 Picking rocks from the bottoms of your shoes will give you better traction and keep you from scuffing up hardwood floors. It also makes your shoes look better (at least the bottoms of them).